Today my wife and I shared a short (20 minute) presentation in our 1st grade daughter’s class. She attends a public school here in Edmond, Oklahoma. 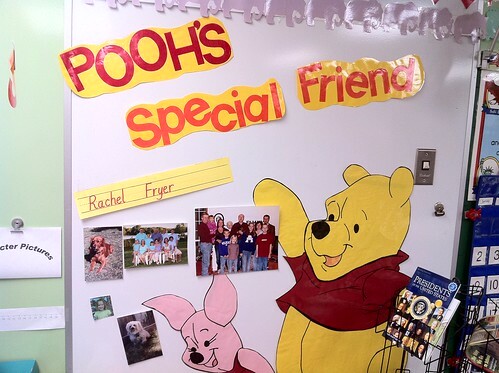 Rachel was “Pooh’s Special Friend” this week, which is basically like being the student of the week. She was allowed to bring some photos and items from home to display in the classroom during the week, and bring her parents as well as a snack to share on Friday. I shared one of Rachel’s “famous” VoiceThread digital stories as well as a YouTube video with the class as part of my presentation, using my iPad, and in this post I’m going to share a few of the technical details about that process which may be of interest. You can read a bit more about our presentation over on Learning Signs, our family learning blog, on the post, “What Do Rachel’s Parents Do?” I uploaded and shared this audio clip for free using uHaveAudio.com. In the case of the VoiceThread digital story, I needed to create an iPad-friendly (QuickTime video) form of the story since the iPad doesn’t support Flash video playback. VoiceThreads can be exported to QuickTime, but I just wanted to play the first three slides of Rachel’s VoiceThread and then the final slide, with several of the comments. To do this, I created a quick screencast using Screenflow software. Sceenflow isn’t cheap (it’s $100 US) but it’s the best screencasting software I’ve seen to date on a Mac, and I bought it a couple of years ago. I was able to make a quick screen recording playing back Rachel’s VoiceThread, zoom in so it filled the video screen, and export it in an iPad friendly format. (I chose the “export for Apple TV” option.) This is the two minute screencast, which I shared on YouTube afterwards. I should have closed Skype on my computer during the actual screencast recording, so viewers wouldn’t hear some of the “skype noises!” The screencast is 2 minutes, 5 seconds long. I want to share a shout-out to Bob Sprankle and Chrissy Hellyer, whose comments are included in this screencast VoiceThread excerpt. Their comments made and have made a BIG impression on Rachel (and others I’d guess) about the power of voice-based collaboration and feedback on shared, digital work. Chrissy’s presentation for the 2010 K-12 Online Conference, “Record, Reflect & Share: VoiceThread as a Digital Portfolio,” and Bob (and Zoe) Sprankle’s BLC 2010 presentations on VoiceThread (available as a podcast) are great resources, btw. I’m guessing for both of them, as well as for me, this particular VoiceThread by Rachel was a SIGNIFICANT digital learning milestone. Since I had a QuickTime video version of Rachel’s Zebra Print episode from the Zoo, I just needed to transfer it (along with the screencast exported file) to my iPad. I initially started to do this via a standard iTunes sync: I “dragged” both files from my desktop and dropped them on top of the iTunes library icons in the upper left corner of the iTunes window. The files were copied into my iTunes library, and then I was able to select them to sync with my iPad. 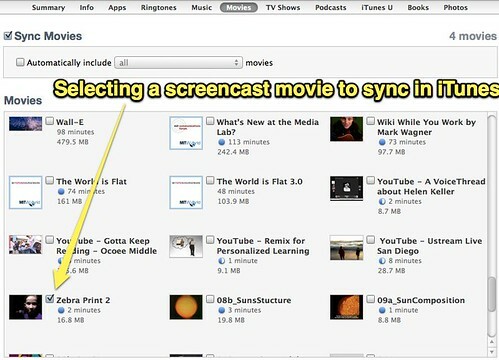 The problem I ran into, which you may have experienced as well, is a long iTunes / iPad sync time. I hadn’t synced my iPad in a couple of weeks with my computer, and there were numerous app updates which iTunes had to install first (before transferring the videos) as well as newly downloaded podcasts. I use BackOff software (free, and a Bob Sprankle tip) to disable automatic iOS backups in iTunes – But even with that time-savings my backup was going to take too long. I needed a fast way to transfer two QuickTime movies directly to my iPad, WITHOUT an iTunes sync. To accomplish this, I turned to the iPhone app (which I already own) Air Sharing. Once open (when your iPad is connected to the same wifi network as your computer) the app permits users to transfer files using a web browser. The app shows the local IP address or Bonjour address to use to connect. No userid or password required, just a direct connection. The transfer of my two files (9 MB and 17.6 MB in size, respectively) took less than 30 seconds combined. Transfer problem solved. The last piece of this technology puzzle was recording the audio for our presentation and sharing it online. 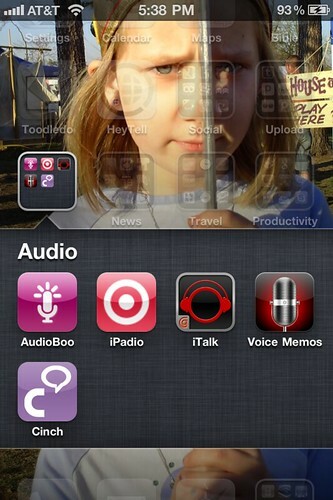 Of the audio app options available on my iPhone, I went with the built-in Voice Memos app. It might of been good to go with iPadio or Cinch for a direct web upload afterwards, but I didn’t. 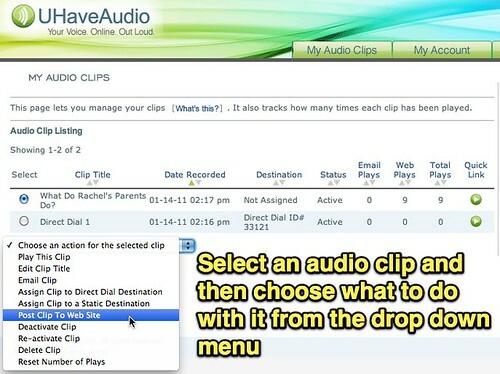 See Tony Vincent’s 2008 post on Learninginhand, “iPod touch and Microphones” and podcast on voice recording for ideas as well as tips on this topic. After I got home, I had to sync my iPhone to my computer to transfer the Voice Memo into iTunes. The audio levels were irregular in the recording, so to fix this I used QuickTime Pro (in QuickTime Player 7, still available in the Utilities folder of my new MacBook Pro because I opted to install it as part of my clean Snow Leopard install) to convert the M4A audio file (created by Voice Memo) into WAV format. I then used Levelator software (free) to normalize the audio clip, and converted the output WAV file into a 32 kbps mp3 file using free Switch software. The best outcome of this short half-hour of sharing was that Rachel was very pleased, and I think proud of herself to be recognized for some of her outstanding work sharing her voice, ideas and talents online. I don’t think any of her classmates knew about her iCarly-style webshow, “The Zebra Print,” or knew she was globally famous in the VoiceThread community for her “Getting a New Haircut” digital story. The second best outcome may have been that Rachel’s teacher asked if I could show her how to do some audio recording on an iPad. She just got one for Christmas. Hopefully we’ll be able to do that after school in upcoming weeks! Rachel reported that being “Pooh’s Special Friend” this week actually exceeded (in her estimation) the fun of being “The Snack Leader” when she was in preschool. My May 2009 podcast, “Behold the Glory and Honor of the Snack Leader!” provided some more background about that thrilling episode of her life. Her part of the recording is the best, and I used Audacity to edit that original file so it just includes “her part.” I posted that to AudioBoo today. Enjoy! Rachel recorded another audio segment in May 2009 about being the Snack Leader which I rediscovered after posting today’s podcast excerpt. That is just way too many steps for most educators to be able to try. Has to be a better way to streamline this. You can clearly see some of the shortcomings of multiple pices of technology mentiopned in your blog post. If I forwarded this post to educators I work with, they’d simply say that’s nice … delete. If Apple supported flash, you’d have done so much less leg work to get the Voicethread’s to play. Or, if Voicethread had an app for iOS you would have less work to do. Two, among many shortcomings I spotted in the post. Teh outcome is wonderful, I just worry about the process.